YOUTUBE stunt group How Ridiculous is inviting fans to take part in a video on the Leaning Tower at the Gravity Discovery Centre and Observatory next month. 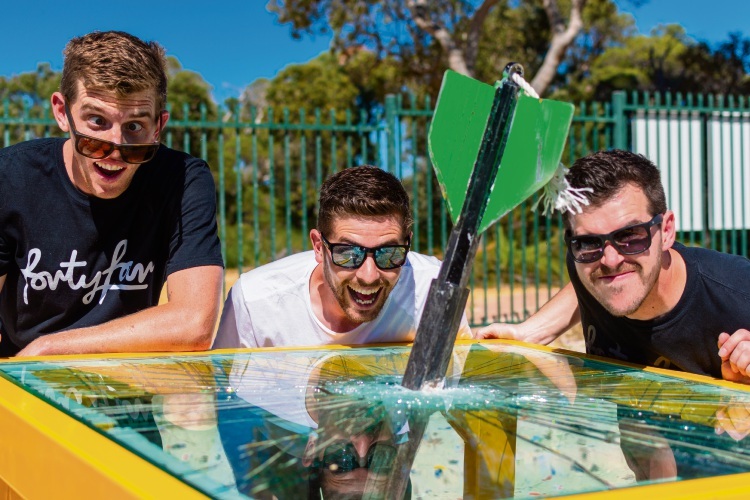 The Perth trio, who have more than 4.5 million subscribers on their YouTube channel, are known for their trick shots and for performing stunts at Optus Stadium and at the 45m tower north of Perth. Recent stunts at the tower have included dropping an atlas stone on bullet-proof glass, a watermelon on a trampoline and a giant dart on a bank safe, with a hammer drop video expected to come out soon. The first 90 people to arrive at the centre north of Perth on Saturday, April 13 and sign up will get to take part in the stunt on the tower. Other participants cheering support from the ground will also be involved in the video. Gates will open 10am and the video filming will start shortly after, finishing about 11.30am. The How Ridiculous team will then do a meet and greet with fans until about noon. There will be a sausage sizzle available for purchase on the day and the centre advised people to carpool where possible. The event is free and the Gravity Discovery Centre will be open on the day, so visitors can buy tickets to explore the displays and get water balloons to drop from the top of the tower once the filming is finished. The Gravity Discovery Centre and Observatory is located at 1098 Military Drive in Yeal. Email bookings@gravitycentre.com.au or call 9575 7577.